Hi there! 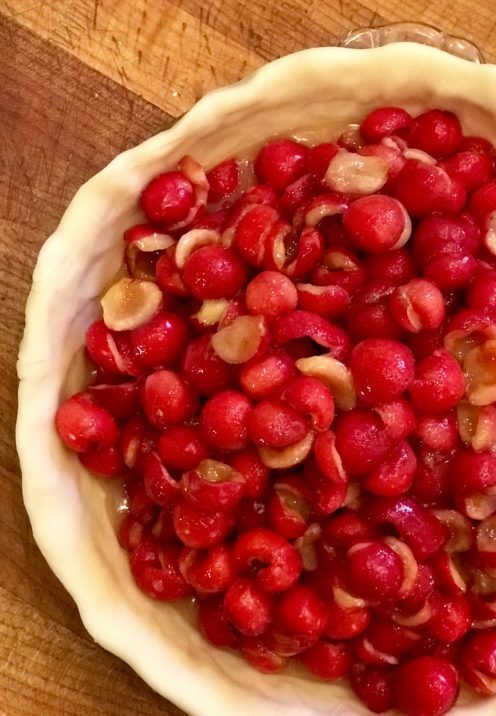 I can’t tell you how excited I am to have developed the most divine cherry pie recipe. I didn’t even know that I liked cherry pie. In fact, until this week I would have told you I disliked it, a lot. On the other hand I really like fresh cherries. But wouldn’t you know, cherry pie is my husband’s favorite kind of pie. So I often buy him a cherry pie from our local bakery for special occasions. 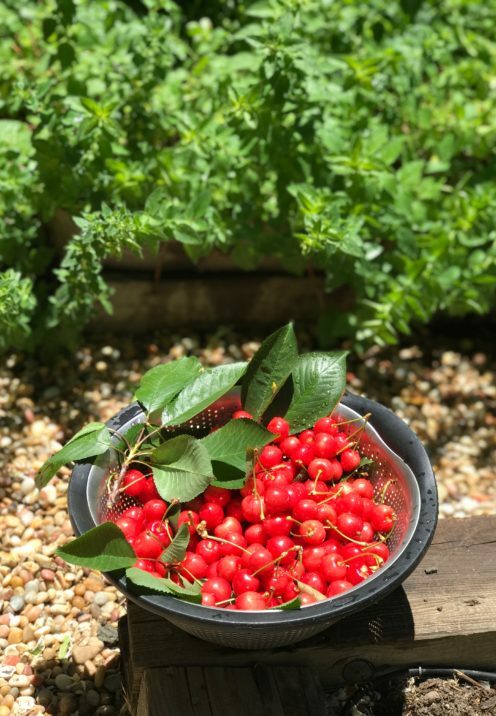 But simply out of the blue, our resident cherry tree, that has never produced more than a handful of cherries, decided to go gangbusters this year. And all of a sudden I was inundated with cherries. 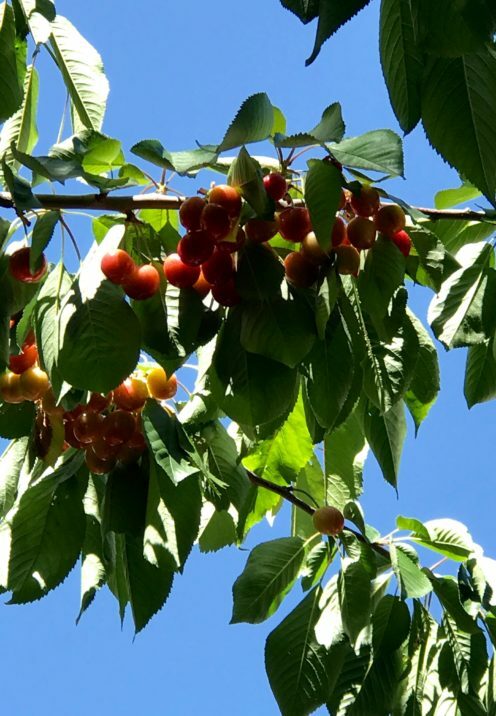 Everyday I’ve been precariously scaling a ladder to retrieve the delicious little balls of juicy wonderfulness from my tree before the birds, bears and deer beat me to them. 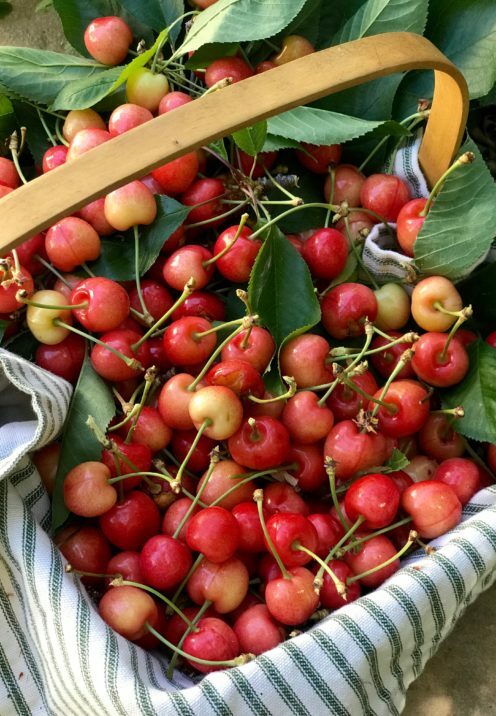 So what does one do with an over abundance of fresh cherries? 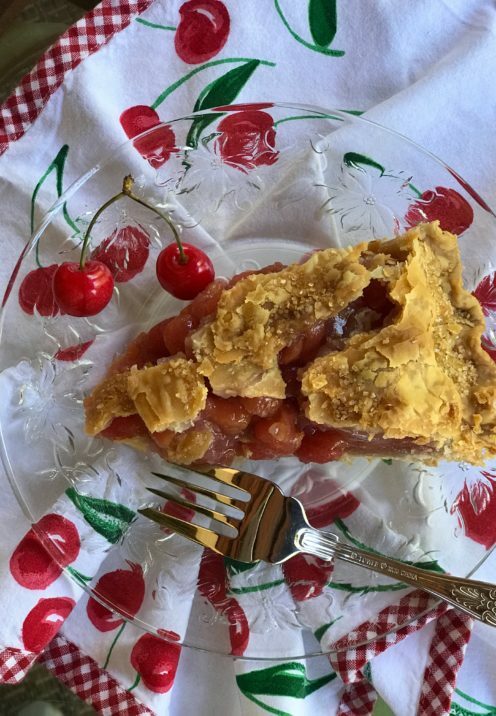 Make the most divine cherry pie, just in time to present it to my husband and father for Father’s Day dessert yesterday. For years I’ve been letting the bakery make my husband his cherry pies. 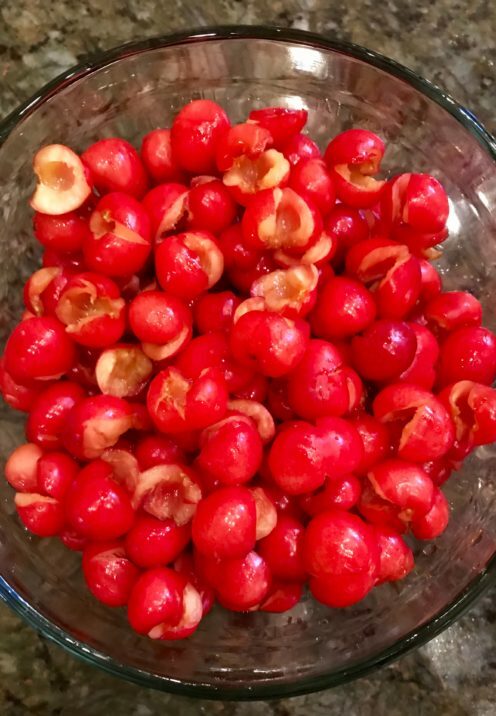 But in my opinion the canned cherries they use to prepare their pies make for something I’ve not been willing to spare the extra calories for. But boy was I in for a surprise when I tasted, what I believe may have been for the first time in my life, a cherry pie made from FRESH OFF THE TREE CHERRIES. So today I thought I’d share with you the simple recipe I concocted for Divine Cherry Pie. 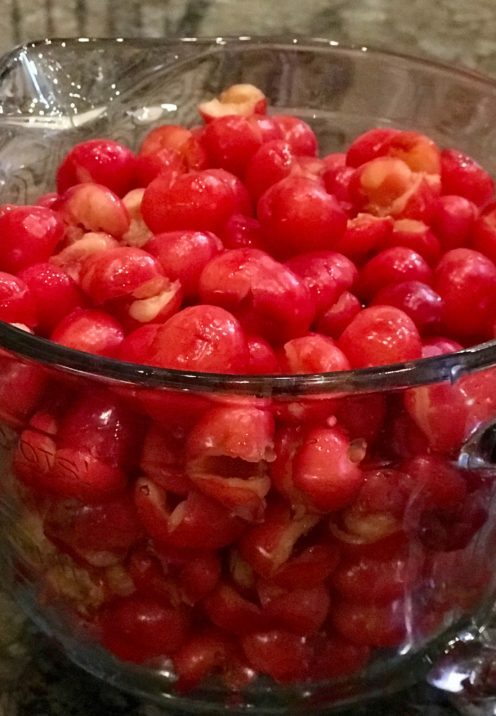 Start by removing the pits from 2 quarts/8 cups of fresh cherries. You can purchase a tool to remove the pits here, which might make the tedious task quicker. But since I don’t own one of these nifty tools I simply pulled the pits out by hand. Next I tossed the cherries with 1 teaspoon Almond Extract. I’m telling you, the almond extract gives this pie a perfect punch of extra-special-flavor! In a separate bowl, whisk 2 Cups Granulated Sugar with 1/4 Cup + 1 Tablespoon Corn Starch. 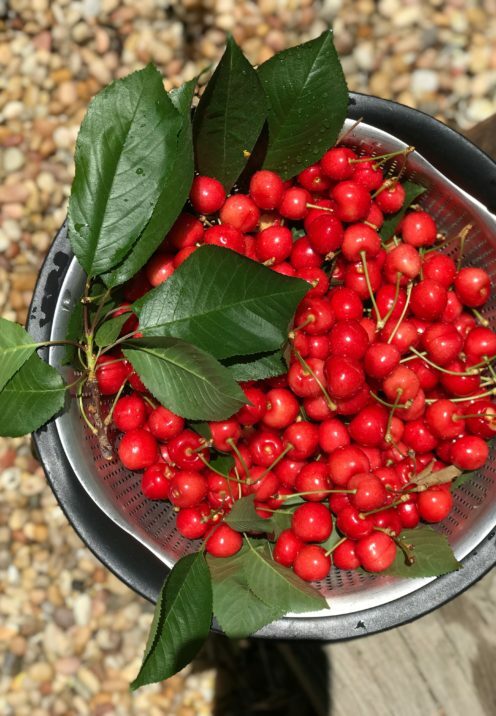 The cherries on my tree are a bit tart, which as it turns out made the pie extra delicious. If your cherries are sweet you could consider reducing the quantity of sugar slightly. Add the sugar mixture to the cherries and toss to coat. 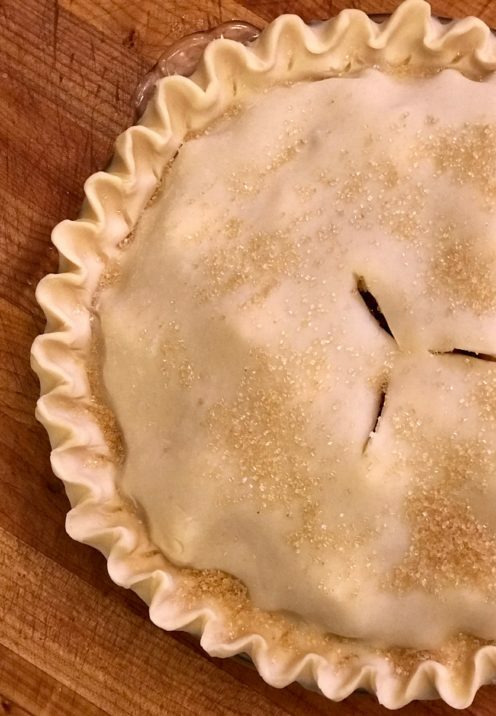 Line a 9.5″ Deep Dish Pie Plate with your favorite double-crust recipe, or keep it simple like I do and use a pre-made pie crust dough by Pillsbury, found in the refrigerator case of your supermarket. Then fill the crust with the fresh cherry mixture. Dot the top of the cherries with 4 Tablespoons of Butter, cut into small cubes. Then top the pie with another layer of crust and form a decorative edge to seal the top and bottom crusts together..
After cutting some vent holes in the crust I sprinkled the pie with Turbinado Sugar and baked it for about 1 hour at 375º F or until the crust was golden brown. I allowed the pie to cool while we ate our Father’s Day Dinner. I then sliced healthy wedges of pie and served it slightly warm. Usually my husband likes his pie a la mode. But honestly, we all agreed that this, the most divine Cherry Pie recipe, needed no ice cream. It was perfectly perfect all by its delicious self. 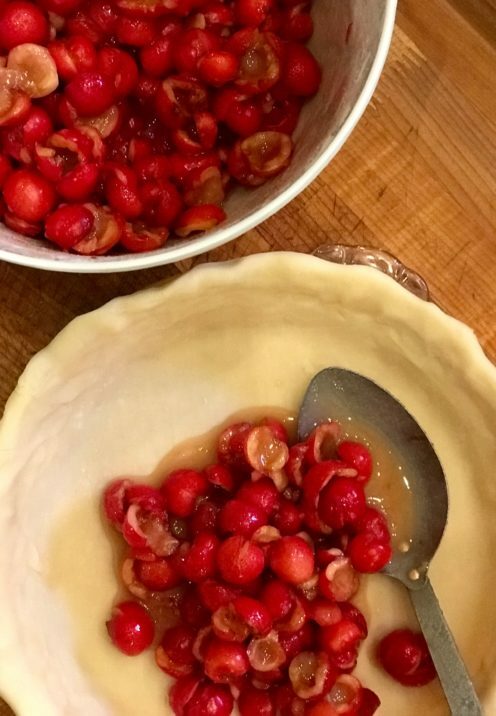 This is the best darn cherry pie recipe. Made with fresh-off-the-tree cherries and a secret ingredient, almond extract, everyone who eats it will be in heaven. Toss the cherries with 1 teaspoon Almond Extract. In a separate bowl, whisk the Granulated Sugar with the Corn Starch. Add the sugar mixture to the cherries and toss to coat. Line a pie plate with your favorite pie dough recipe, or use a pre-made pie dough. 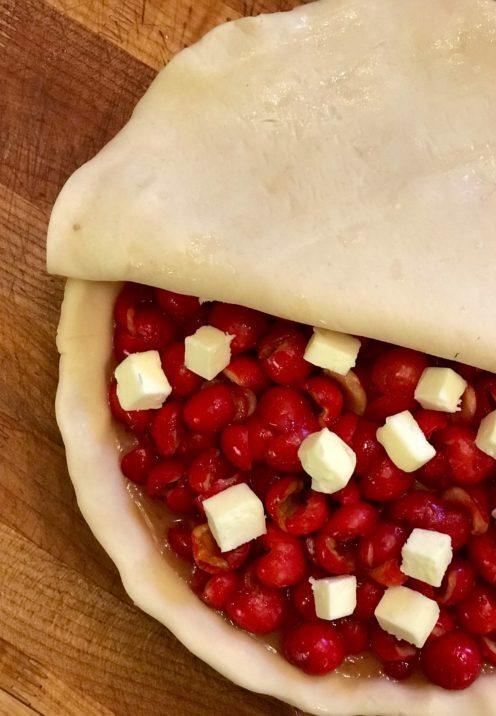 Fill the uncooked crust with the cherry mixture. Dot the top of the cherries with 4 Tablespoons of Butter. Top the pie with another layer of pie dough and form decorative edges to seal the two crusts together. Cut some vent holes in the crust. Bake for about 1 hour at 375º F or until the crust is golden brown. 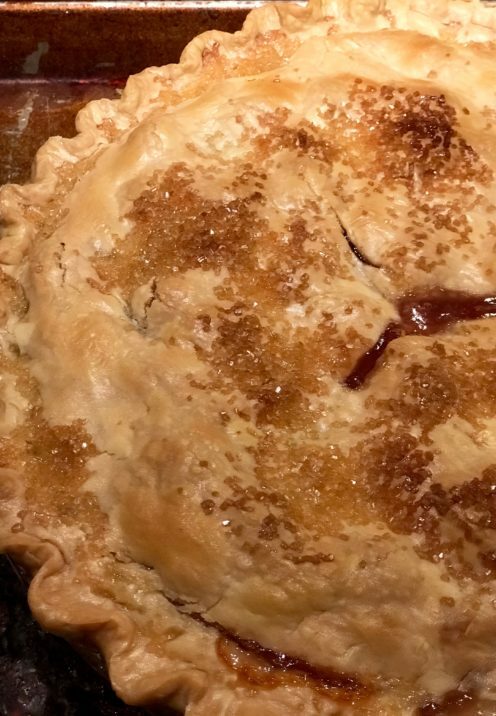 The cherries on my tree are a bit tart, which as it turns out, made the pie extra delicious. If your cherries are sweet you could consider reducing the quantity of sugar slightly.